Too busy with other stuff to finish the several half-written blog posts on my computer. So, instead, I’ll point you to some interesting discussions at The String Coffee Table. Thomas Thiemann wrote a rejoinder to Hellings and Policastro and the papers by Nicolai et al (I, II). Anyone who’s spent any time looking at the literature on LQG quantization comes away with a a lot of serious questions. Theimann’s paper is billed as an attempt to respond to those questions. So it seems like a salutory time to reach out and start a serious dialogue on the issues raised. Aaron Bergman has two posts, in which he poses a series of questions about selected points in Thiemann’s paper. The first is about the LQG quantization of the harmonic oscillator (one of the examples tackled by Hellings and Policastro). See also Robert Hellings’ response to Thiemann. Aaron’s second post is about the so-called Master Constraint Programme, the subject of a series of five papers by Dittrich and Thiemann (I, II, III, IV, V). Even in the simplest possible case: a finite-dimensional phase space, with first-class constraints, their proposal doesn’t seem to work. 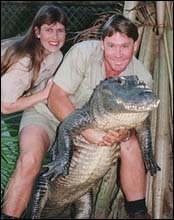 On a completely different note, I was sad to wake up this morning to learn of the death of Steve Irwin. My kids loved his show (as did I). He brought a infectious enthusiasm to the somewhat tired genre of the “nature documentary.” He died, as he lived, getting as close as humanly possible to the wildlife he was filming. Steve Irwin was a great enviromentalist; I really enjoyed his forums too. Rest in peace Steve and thank you for all the times you’ve made us enjoy. Very strange. I found the same behaviour on Firefox 1.5.0.6 and Opera 9.0.1 (both on MacOSX).